I was away this past weekend for a race - The Tour of Arad - three days of racing. That means three days of eating. We rented a house for the team and had a few extras join us too. I was in charge of planning and managing the food. The first thing to check when doing something like this is what people's dietary restrictions are. A few of us eat everything, some don't eat meat, others full vegetarian and some vegan. So the plan was make a things as vegan as possible, with additions for those who want to eat more animal related products. One of the dishes I made was a lentil curry. The serving suggestions was over roasted sweet potato, with some chopped coriander and chopped green onions. I think its really nice with, feta cheese, yogurt or sour cream too. Its a great dish, really easy to make and in large quantity too. Its not too heavy, but filling and its nutritious too. Great for a weekend of racing. 3) While the lentils are cooking, chop the garlic, onion and tomatoes. 5) Don't let it get too hot. 6) Put the onions and garlic in the oil and turn down the heat so that they sweat. 8) Turn the heat up a little and add the tomatoes, stirring well. 9) once the mixture starts to bubble, turn down to a simmer and allow 5 - 10 mins to thicken. Stir occasionally. 10) Add lentils, if you are making a larger quantity then I would ladle the lentils in stirring well each time to get and even distribution. 11) mix well and turn off the heat. It was a race of mixed emotions for me. Last year I raced this same race in the same category and came second in the age group category. I was mostly happy with that. The year before I was dropped after the first lap and had to ride 60km in the wind by myself. Today was windier than last year and the was a really big peloton, add to that the rain. It didn't actually rain during the race but did the course was we, lots of puddles, standing water and greasy roads. I was nervous and I think I was not the only one. I knew that I had to stay alert, watching other riders closely. I had to think about position and rely on my team mates trying to keep me save. The TL;DR version of this post is that I came, I raced, I tried to get away in a break, I failed, I sprinted at the finish and got 3rd in my age category. I was extremely disappointed with the result. I was told by my wife after the race "You have never been happy with any result you have achieved no matter what the result." So maybe I should look for some positives in this race. The last race I did was the end of last season, in June the national championships. I had a horrible time with very high blood sugar before the race. I may have been fatigued too. Either way the race did not go as well as it should have. I was in good condition. I had worked hard, and too much glucose in my blood stream had made every pedal stroke an effort. I was very unhappy, how did I get my control so wrong. So I planned ahead. No carb loading the night before. It gives me high blood sugar all night and high blood sugar in the morning. I had my Dexcom sensor on from the Wednesday night so I could keep track of what was going on. Thursday day I was mostly low carb and stayed stable. Thursday night we had pasta and plenty of insulin. The goal was to increase glycogen levels. I ended up havine a very high night and early morning. I corrected when I work up, but at least I wasn't waking up like that on race day. Friday I took it easy, no training, just some strethcing. Friday night I ate only a small amount of carbs and some protein. I got the insulin blanace right and woke up, at 430am, on race day with my BG levels just above 100. Could not really ask for better. Now came decision time, with 3 hours to the race I could take some insulin and not worry about how it would effect me during the race. I took a couple of units and had some toast and a yoghurt. I needed something to take the edge of the hunger and some extra fuel for the race. I drank several gallons of coffee on the way to the start and some water. Checking my Dexcom the whole time I found that my BGs were only going up slowly. I got setup once I arrive, had a small sandwhich and started my warmup. Again not wanting to burn all my fuel before the start. I checked my BGs, everything stable, although slightly on the rise. I have come to expect these pre race rises. A warm up that is a bit too intense, the excitement and adrenaline all add up to high blood sugar. The only way to combat it is to take even more insulin but that leads to far worse problems during the race. So I was on the up but nothing drastic, still a sideways arrow telling me that I wasn't rising too fast. Throughout the race I paid attention to my Dexcom for the first couple of laps it stayed high, when it finally started to come down with a diagonal down arrow I was able to take on a gel. Other than that, I just drank wanter with electolytes and I was fine the whole race. Finishing with BGs in an acceptable range. This is a huge positive from the race. Not something I get right every time and can really make or break me. I woke up fine, I had something small to eat, coupled with the pre race adrenaline I saw a rise, but not a sharp one. Most of the race I was a little higher than I would like. The small amount of insuliin taken at 430am now mostly gone from the system allowing glucagon to do its job and release sugar from the stores. Again intensity and adrenaline pushing sugars higher. Once they dipped below 170 with a diagonal down arrow, I had a gel. This was during the last lap while I was on a break, I need to keep my energy level high. Post race there was a high, mostly due to eating a cookie and a sandwich to recover, but also as a response to the stress. A corrective dose followed by some lunch sorted me out for most of the rest of the day. Why was I so upset with the result? We had a team plan and I had a personal plan. Either one involved working together and winnning. The team plan was to have 2 guys protect myself and another rider so that I could lead him out for a sprint finish. He got cramp after one lap and dropped out, another rider got dropped from the peloton. That left me reverting to my personal plan, get in a break and stay away to the finish and go for it in the sprint from the small group. The problem was that a break went early and we never managed to bring them back. My teammate said I should go after them if I had the power to get over. I didnt think they would stay away the whole day, as they went in the first lap. The final two guys that were not realed in finished with a gap of 1min over the peloton. I had tried to chase them down with just one other guy. It didnt work and I think that may have cost me some positioning on the final sprint. My chase was interesting, a strong guy went off the front and started to pull away. A couple of guys made vague attempt to catch but pulled off leaving me on the front. I had to gauge my effort, this was the second of three laps and I didnt want to expend all my energy pulling the peloton up to this guy. I pushed a bit harder and monitored my heart rate. I spun the pedals nice and smoothly and looked round to see a big gap on the group. I continued and checked if I Was gaining on this chasing rider. I was stuck in no mans land and I had to make a call. Chase him down and try to work together to do something, or fall back to the group. My plan was to be in a break, and given the wet conditions it was the safer place to be. So I went for it. I pushed really hard but felt good. My heart rate climbed, my legs burned but I was gaining on him and distancing the peloton. I thought maybe if I could catch him and we could continue on we might just do something. Once I had caught him there were two of us. We decided to do one minute each on teh front. We wored well together and caught a rider dropping back from the break. He stayed with us but refused to work, so there were just two of us working to say away from the peloton. We crossed the start finish line to start the final lap and turned the corner. We continued to push on into the headwind. I looked down at my garmin and saw that our speed had dropped from 40kmph to just over 30. Soon the peloton was upon us and we were done. I stayed in the group from there until the end of the race. I still dont know if it was a mistake, rather a good attempt at the right time that was just unluckly or a foolish thing to do that lasted too long and wore me out. What ever the case it meant that I didn't quite have the legs for the sprint and maybe if I had stayed protected that little bit longer I could have done a bit more. The guys in my age group were only just infront of me. One more kick and I could have got round. When it came to the sprint I found myself in the wrong train. I had latched on to the pointy head of the group and they were picking up speed. I was accelerating with them but I looked to my left and there was faster train coming round us. I saw the 500m to go and looked for a wheel to latch onto. I saw my rivals and went for it even though I could see there were many people ahead and we would have no chance at overall positioning. The disappointment had already set in and I think I may have stopped pushing so hard. I followed them guys in front of me in and went to catch up with my team mates. So it didnt work out. What positvies can I take from this race. Firstly I had a plan, and with some margin of error I executed it. I didnt go when I wanted to, but I did give a good shot. I worked well with someone else and looking at the analysis I pushed hard for a long time which is really satisfying. I feel that I could have push harder in the sprint. Just squeezed that bit more. This is something I have learned from this race that I may need to work on. Having said that, looking that the final segments of the race on Strava I see that I been my previous PRs, which means I was faster than last year. Thats an improvement and means that fron a physical point of view I did what I should have. ... but I am not. I will work harder and next race I will come back stronger. Today I woke up at my usual 5:30am. It really took a huge effort to get out of bed. My blood sugar was fine, my legs felt fine. I was a bit short of sleep but three early mornings with 5 hours of sleep will do that to you. I slowly got dressed, I dragged myself to the car and drove to training. I hurriedly got my stuff together, bike out of car, front wheel on, Garmin on mount and switch on. Phone in pocket, check blood, glucose meter in pocket, stuff pockets with gels and bars. Pump up tyres, bottles on bike. Gloves, shades helmet, shoes. My trainer comes over while I am getting ready and mocks for being late. Lock the car, jump on the bike and start my warm up. I'm tired, but I am on my bike and you know what. I just love riding my bike. Suddenly I have energy I am awake and raring to go. Can't wait to start the tour. Wix: What are you doing again? Rob Woolfson (aka Type1Cycling): Riding my bike from Barcelona to Vienna! Full route of the tour. W: Are you insane? How far is that? RW: Maybe, isn't everyone here? Its 2300Km by the way, but that's not the worst of it, there is 33,000m of altitude - that's a lot of uphill riding. W: Yeah I guess everyone here is a little nuts bit but I think you take the cake. Why on earth would you do this, is this fun for you? RW: I am doing this as part of Team Blood Glucose's (TeamBG) Event - The Diabetes Grand Tour. We are raising awareness about diabetes, and more importantly the benefits of exercise on diabetes. We are doing research into the effects of endurance sport on diabetes and raising money for The charity TeamBG so that they can continue to put on events that encourage more people with diabetes to get out there and get active. At big events like this over achievers like my brother and me get to show people that our Diabetes doesn't hold us back, that there really is no challenge that we cannot accomplish despite the condition. W: That sounds great, does this mean you have diabetes? cos you dont look fat. RW: I do have diabetes, but not THAT type of diabetes. There are two types, Type 1 (some people call it Juvenile Diabetes) which is an autoimmune disease that ends up with the body no longer producing insulin, and Type 2 usually diagnosed in older patients that often have lead unhealthy lives, they still produce insulin but have become resistant to it. My brother also has Diabetes he was diagnosed at 13 and myself at 27. W: That's interesting, so what does exercise have to do with anything? R: The key to a healthy diabetic life is balance. It is important that I keep my blood sugar with in a range most of the time. If I do not I could have some serious medical complications later in life. Exercise and staying healthy are key components in the balance equation. It also raises insulin sensitivity which is especially important for Type 2 diabetics as it could meant that along with a sensible diet they need no other treatment. W: Wow this is a great thing you are doing, but how is Wix involved? 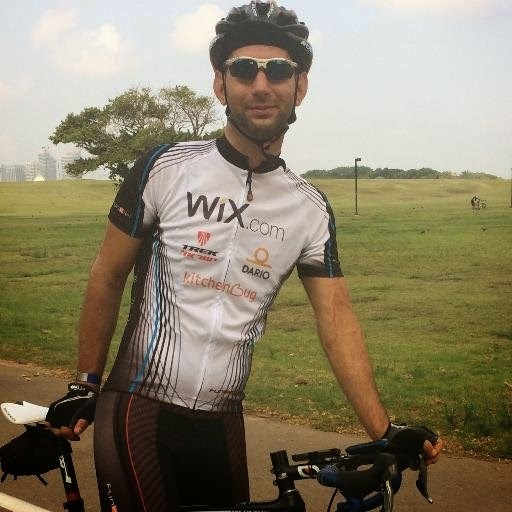 RW: As part of the Wix for the community project Wix is sponsoring me to ride the tour. It is incredibly generous and has allowed me to make a large charitable donation to the TeamBG cause as well as raise money from other people with out having to worry about funding the trip as well. It is really inspiring and heartwarming that the company I work for could feel so passionate about something I am involved in outside of work. I am forever grateful. W: So glad we could help. How can other people get involved? RW: I am currently finishing my training, and writing about it and more detail about the tour on my blog, during the tour I hope to update the blog and at least my twitter whenever I have access to the internet. I will be uploading my rides to Strava and Garmin Connect in case anyone wants to follow my exact progress. You can also visit the TeamBG site and read about what we are trying to do (sadly I haven't persuaded them to move over to Wix just yet). If there are any keen cyclists who like to track their rides I recommend using Strava, I have created a Wix group that you can enjoy so we can keep track of each others' rides. You can also donate to TeamBG, there is a yellow donate button near the top right. When you fill in details please add that is either on my behalf or from a Wix employee. A few months ago we were invited to a Friday night dinner at some friends. They always have a bunch of people in together and the conversation is lively and entertaining. I get in and sit down on the couch while my host fetches me a large glass of whisky. While I am waiting I start preparing all my diabetes paraphernalia, Changing needles, testing blood sugar, injecting my long acting insulin. As I am doing this one of the other guests notices what I am doing and says that she also has type 1 diabetes. My wife jokingly says that she knows what we will be talking about for the rest of the evening. We talked about diabetes, about management. I told her about my cycling and about Team Blood Glucose and the Diabetes Grand Tour. She was suitably impressed. I have heard many stories of people just not knowing other people with diabetes, particularly other type 1s not knowing about each other. I am lucky, my brother has had diabetes longer than I have, so I have always had someone to talk to about this stuff. However since I have been involved with the Diabetes Online Community (the DOC), my world has been opened up to more people, more knowledge, more technology and more opportunities (often opportunities to help people). I have consulted with app and technology makers (for free), I have ridden across the Pyrenees with some of the most inspiring people with diabetes that I have ever met. Fast forward to this week. A few days ago I was in the bike shop, apparently I hang out there a lot lately. I got a phone call from a number I didn't recognize. I answered it and it was the same girl who I had had dinner with a few months earlier. She told me that her pump was broken, she had no other insulin (her back up supply had expired), I was the only other diabetic she knew of close by, could I help. It worked out nicely that she was on Novorapid in her pump, which is the same as I use. I told her that I had spare and she could come round and take what ever she needed. I got home opened up my computer and went straight to my diabetes Facebook groups. 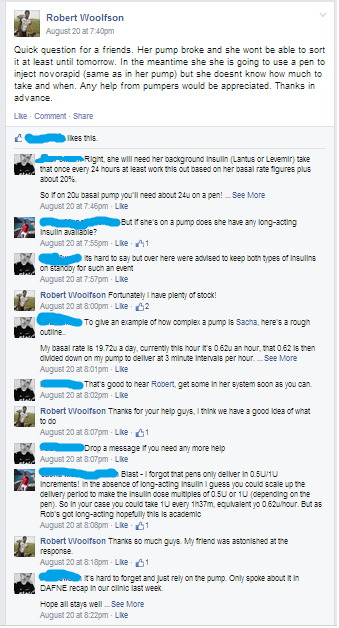 I posted a question to Sporty Diabetic Type 1s and GBDOC and by the time she over I had plenty of help and and advice. It was that quick, and that easy. A number of suggestions were posted and we worked out a plan. Clearly this was partially an issue that my friend did not have a backup plan. It is something she will make sure in the future she has for cases like this. In the end she was fine, it was just one night and the supplier got back to her the following day and fixed her issues. The whole experience for her was eye opening, she was amazed at the response from people I do not know personally (though I have had many online conversations with them). It also reminded me of an app that is designed for exactly this sort of thing. The HelpAround app allows you to be part of a community, for example the diabetes safety net. Then you can contact other people around you if you have a question or problem, if they are close enough to your location they maybe able to help you out. Some power reading for the past couple of days. Fitness is often measured by the amount of power you can put out over certain periods (10s, 1m, 5m, 20m) The last one is key as it determines a lot about how you train. Sprinters generally aim to improve their power for 10s and 1m over the longer periods. Endurance riders favor training for the longer periods. Here are my best power outputs for 1min and 10s. Reasonably happy with the average, but would like a more consistent looking graph. I will post more about this as I learn to train with my power meter. I am yet to do the 5 min and 20 min tests properly, when I do I will post again. Its probably best if I do them on a trainer it will give a more consistent looking graph as it is free from outside influences that are unavoidable outside. Last year I took part in the mHealth Grand Tour, for my part riding 500km into Barcelona - day 11, day 12 day 13. This had been my biggest cycling challenge to date. Not only was I able to ride it with my brother, Andy - also a type 1 diabetic since the age of 13, but also many other people with diabetes. We learned so much from each other and it was great to have the support of a ride organised for our benefit, catering to our every need, from food and energy supplies to CGM sensors. Not only was I lucky enough to have a place on the tour, and be physically able to take part but my family and friends sponsored my ride to the tune of around 2500 pounds. That was a big donation towards TeamBG, and has helped the team with events this year. This years tour will run from Barcelona to Vienna starting on the 30th of August, and I am doing the whole thing. Having asked family and friends last year to sponsor me I did not want to pressure people once again for money, even though this year I am taking on a bigger challenge. So I went a different route. I asked for company sponsorship in exchange for having logos printed on a custom shirt. As a result I have had all my costs taken care of through the sponsorship of some great companies. It has helped me pay for the tour, travel, the cost of training (energy gels and bike parts) and printing some custom kit. As I have had my costs taken care of it has meant that I have been able to make a large personal donation to TeamBG. It is with great appreciation that I would like to thank all the people that have pushed at the relevant companies for me to get sponsorship. It means a lot to me that they regard me and our relationship so highly that you would do this for me. So a big thank you to Shira, Brenda, Keren and Amir for helping me out. You have made this very special for me and it will not be forgotten. Wix - Wix.com is my employer. They have given me time off work to do the whole ride and made a substantial donation. They are a great company to work for and though I have only been there a short time I feel like an established member of the team. Wix is an online platform for building websites. You can use it to build a website with zero programming ability. There are many features and add-ons available to enable the users to create professional looking sites. With 50 million users it is the biggest platform of its kind. Dario - Dario makes an app and a device that plugs into a smartphone audio port. They have just released the device in the UK and from September the strips will be available on the NHS prescription. The app itself does not just allow you to track blood sugars but also food intake, insulin dosages and exercise. Kitchenbug - The best way to describe this is Pintrest for recipes. If that means nothing to you, then its a web app that allows you to collect recipes found on the web into different collections. You can share the recipes and collect other peoples recipes, but the best part is that when a recipe is collected the information is read from the website or blog and converted into a formatted recipe. The recipe has the ingredients and directions along with the nutritional information. This is especially useful for people with diabetes who are trying to manage their carbohydrate intake. Trek - One of the biggest names in cycling, their local franchise gave me a huge discount on essentials, some new kit and full service. They sponsor my team here in Israel and have carried that over to sponsor me on the tour. They give me great service every time I go in there, whether its to buy a couple of inner tubes or to fix a wheel. I ride with many of the guys that work there regularly, they a great group of guys and fun to ride with. Funkier - Producers of both my team and my tour kit. I gave my new shorts a test ride today and they are the most comfortable shorts I have worn. They were extremely patient with me getting the design exactly right before printing up some long and short sleeve shirts with the above sponsors names on. They look great and allow me to show off everyone that has helped me get to the tour. If you would still like to make a donation to TeamBG then please feel free to do so. Click near the top right of the page (the donate button) and when you have the option to give a reference just say its in my name. The more money we raise the more events we will be able to put on next year, the more we can continue to help the wider diabetic community. Thanks to all my sponsors and supporters I couldn't do it with out you. Keep up to date with my progress by following my blog, and twitter. You can also follow my rides on Strava. Here we go again. With just over a month to go I have really ramped up my endurance training. Yes its back and I am am doing all of it. 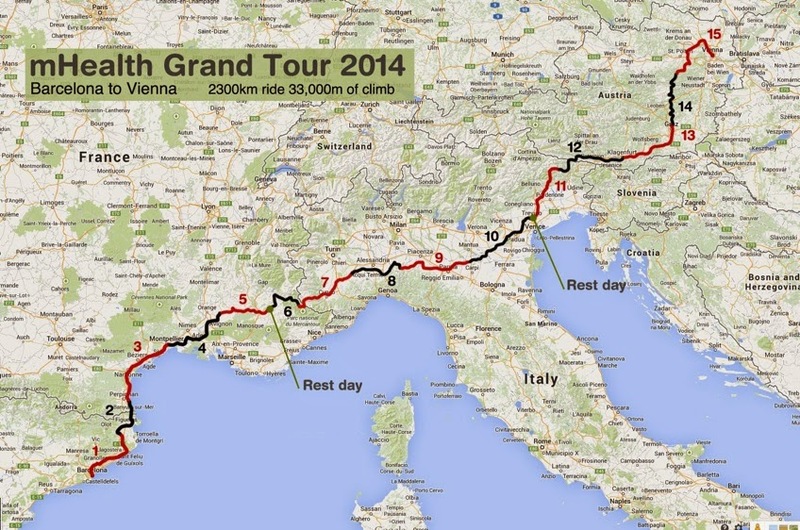 The mHealth Grand Tour has returned. 2300Km and 33000m of altitude - Barcelona to Vienna crossing the Pyrenees, Alps and the Dolomites, including a visit to the legendary Mount Ventoux. This is going to be epic. Last year I was only able to do 500K, just 3 days of riding. This year I am doing the whole thing, 15 days of riding. I have been lucky enough to receive some sponsorship for the Tour which has covered my expenses. As such I will be making a donation to Team Blood Glucose who have worked hard with a small budget to put on the event. TeamBG have had a great year with many of its members participating in a range of events from 5K runs to Ironman events. There was even a TeamBG organized bike ride in Surrey including the famous Box Hill climb, attended by new and old members. Much like last year the purpose and aims of the tour are will be to raise awareness about Diabetes, more specifically, as per TeamBG's mission, to demonstrate the positive effects of exercise on Diabetes management. Given the scale of the bike ride, we will not just be showing that exercise is good for people with Diabetes (as it is with everyone) more that there is no challenge too great that cannot be conquered regardless of the condition. I know that if it wasn't for my Diabetes I wouldn't have been pushing myself to complete such a lofty goal. 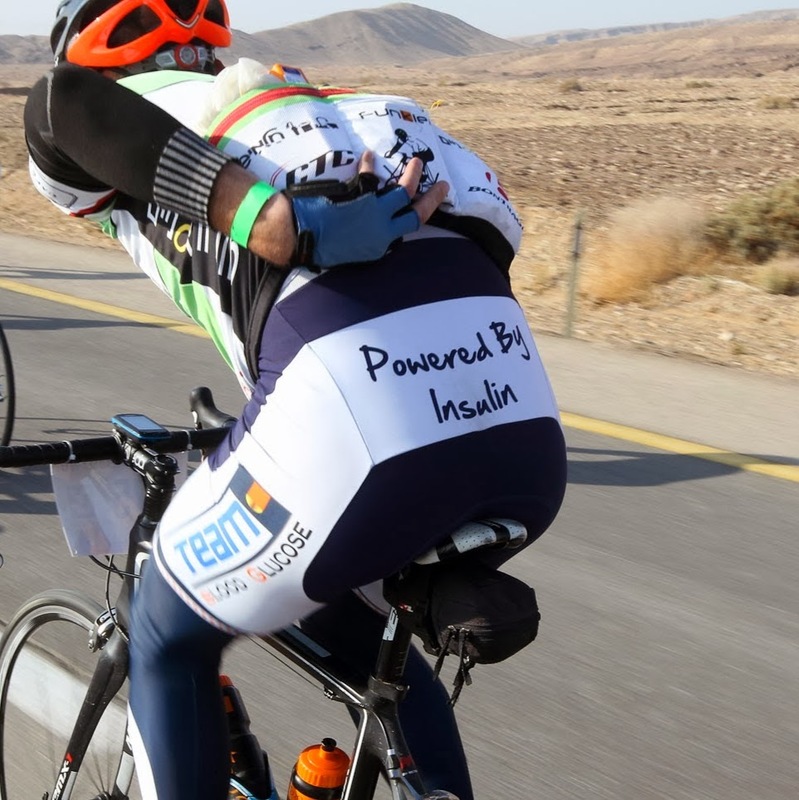 We will be continuing with scientific research through Imperial College London monitoring the effects of prolonged endurance exercise on Diabetes, and as there will be riders with and without Diabetes there will be a suitable control group for comparison. As mentioned the ride will be raising the profile of the work that TeamBG are doing. Last years ride had a focus on technology and how inter-operability between the interested parties can be leveraged to create applications and technology that can hugely improved the quality of life for people living with conditions like Diabetes. This is a great article by Ian, one of the people involved in the mobile technology side who I met on the tour last year. It was a perfect partnership so many of my diabetic friends are friends because of technology. I entered this world through the Diabetes Online Community (DOC) and I continue to engage with people through the various Facebook and Twitter communities. I use apps to monitor my Diabetes management though logging my Insulin, blood sugars, food, and exercise. I have blood glucose meters and continuous glucose meters, all supplying me with data. Mobile technology is where its at and where it is going to be for Diabetes, it was no coincidence that we finished in Barcelona - the Mobile World Capital. 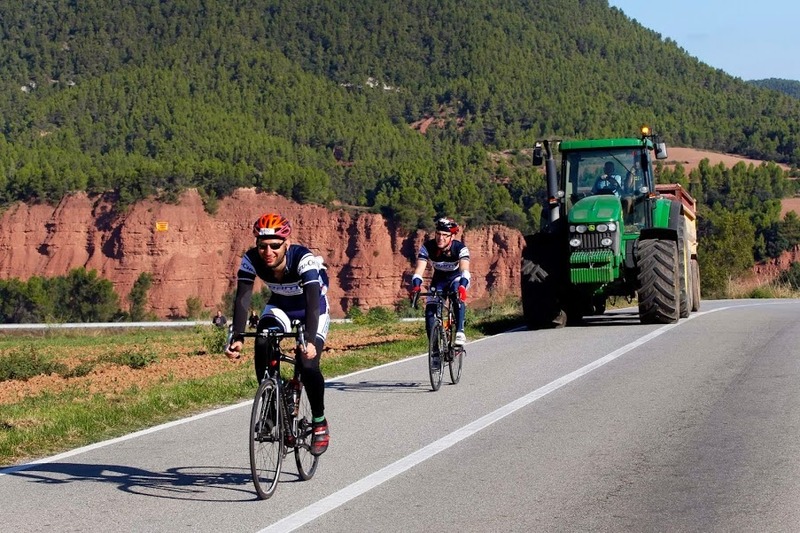 The ride was also successful for two of the amateur TeamBG riders, Pierre and Simon, who were picked up by professional Diabetic cycling team Team Novo Nordisk. This year I look forward to meeting up with my brother, Andy, to ride together again. We are both fitter and stronger and challenging ourselves with a bigger ride. I also look forward to seeing many of the great people who I met last year and hopefully some new faces too. Team Blood glucose is a not for profit organization. It relies on donations to survive. As I have raised the money required to send me to the tour I will be donating some of my own money to TeamBG. Additionally I would be very appreciative if you also donate a small amount to help the cause. If we raise enough then that will enable us to put on more events next year. So please take the time to donate by clicking on the donate button in the top right of the homepage. I made this yesterday for a dinner we were invited to. It went down really well and I was asked by a few people what the recipe was. I am not generally a big dessert person, I wasn't before I was diagnosed with diabetes either, but I do love me a chocolate mousse, especially if it is dark and rich and not too sweet. I had one other restriction - no milk. I made chocolate mousse a few weeks ago with butter and cream, it was delicious and I was hoping I could replicate the taste without those ingredients. The reason for the milk restriction was that we were having Shabbat Dinner with friends and the main course was meat. That means for religious reasons dessert cannot contain any milk, due to the prohibition of mixing the two. I was reluctant to use margarine as a replacement for butter, thankfully I didn't need it. So lets get down to it. I used Lindt 70% cocoa chocolate. I was tempted to use a mixture of that and the 85% but as I didn't know who would be there I kept it simple. Feel free to experiment, if you use a higher percentage then you might want to add a little more sugar to stop it from becoming too bitter. I kept things pretty simple but instead of the 2/3 cup of water you can use 1/3 cup water and 1/3 cup something else, possibilities are espresso, Tia Maria, chocolate or orange liqueur, brandy, or orange juice. Break the chocolate into a large metal bowl and add the water (and optional ingredients). Melt over a double boiler / Bain Marie. 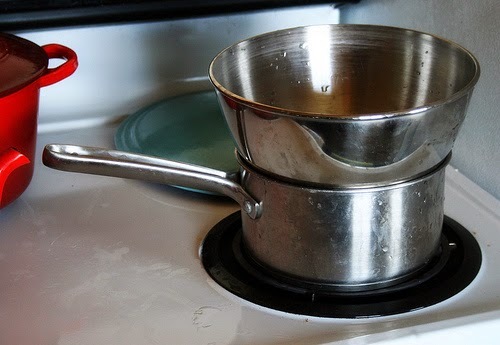 To make a double boil fill some water into a large pot and bring to the boil, you need enough so that it wont boil away but not enough that it will be touching the bottom of the metal mixing bowl. Once the water comes to the boil place the mixing on top of the pot and turn down to a simmer. Let the chocolate start to melt for a few minutes. In the mean time separate the egg yolks and whites. I use one less yolk, so I had 6 egg whites and 5 yolks. Make sure there is no yolk in the white, better a little bit of white with the yolks than the other way around. Once the chocolate has started to melt into the water stir with a wooden spoon. It will look a little weird at first but mix it well and it will become silky smooth. 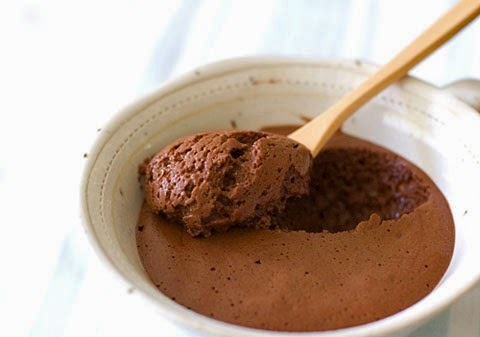 Keep mixing until all the chocolate has fully melted. It usually takes about 5 to 10 minutes. Remove from the heat. While the chocolate is cooling a little whisk the egg whites. I use a stand mixer (a Kenwood chef older than I am), I have done this by hand, it took two of us half an hour of switching in and out - I do not recommend this. A electric hand whisk will do the job very well too. Once the whites start to froth slowly add the sugar. The more you add the sweeter it would be, I would said not more than double though. Continue beating the whites until they are firm. Lift the whisky out slowly and if forms a stiff peak then its ready. If the chocolate has cooled a bit then its time to add the egg yolks, if the chocolate is too hot you will cook them. Mix them through the chocolate mixture. Combine the whites and the chocolate. I start with about 1/4 to 1/3 of the whites, folding the white into the chocolate until it's uniform, then another 1/3 and then the rest. Each time carefully folding the white into the chocolate. Be careful when folding, if you are too rough with it then the whites will lose their fluffiness and you will have pudding instead of mousse. Cover with plastic warp and refrigerate ideally for a few hours before serving. If it looks a bit runny at this point don't worry it should set in the fridge. Before serving grate some chocolate over the top (If you used orange juice in the mix then perhaps add some orange rind to the topping) and sprinkle lightly with coarse salt, it's a really nice treat that brings out the flavour.